Form fields are a fantastic way to record every piece of important data related to your checklist, and even automatically populate other apps with that same data. Select the task you wish to add them to, then hit the form field button and select your chosen field. 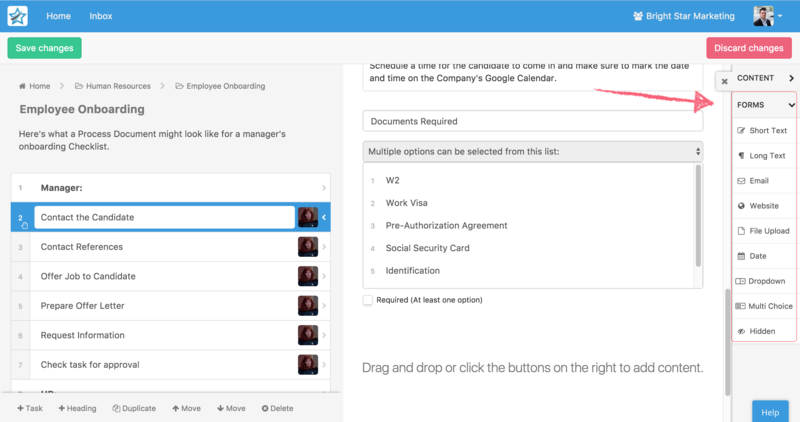 Want more information about how to automate your checklists? Check out our ebook on how to use Zapier to automate tasks. You have a selection of the following fields, along with one “Hidden” form field that can only be seen when editing a template. The short text field is best suited for recording aspects such as employee or company names – any data which is guaranteed to be no more than a couple of words. The long text field is best utilized for extra details or any information which is likely to go beyond 3-4 words. For example, you could record additional inspection or meeting notes, a support conversation, an address, etc. Email fields do exactly what they say on the tin; store email addresses. Using these instead of the standard single line fields will allow you to quickly differentiate between email addresses and other information, as the symbol is unmistakable. Storing email addresses in these fields also makes it easier to integrate your checklist with another app to send emails automatically; the information is separate and so easier to locate. Website fields are specifically designed for storing URLs. Much like email address form fields, this is because it is it easier to distinguish them from single line field data, but also to make API integration a cinch. The file upload field allows the user running a checklist to upload any important file of their choice. For example, if an important document needs to be signed, a copy of the signed version can be scanned and then uploaded to your checklist for safe keeping. Date fields are perfect for just that – dates. Whether you’re recording the date that a checklist is run, a due date for a particular task, the time of a support conversation or even the start and end of an upcoming holiday, any and all important date and times can be set in stone. Dropdowns are a fantastic way to add some multiple choice into your checklists. If a vital task has several potential completion results, use a dropdown and type in the potential outcomes for the user running the checklist to select from. For example, a potential drop-down could be “Project Status”, and the options could be “Incomplete”, “Waiting Review” and “Complete”. 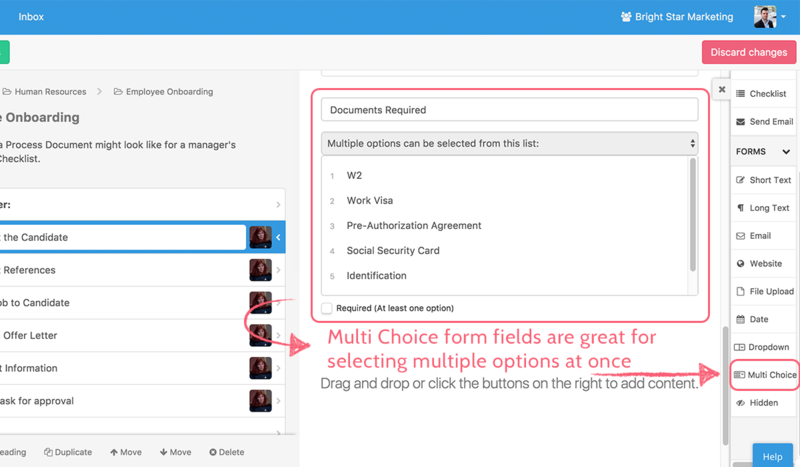 The multi choice field is similar to the dropdown field, except that multiple options can be chosen at once instead of only one. An example would be that you have multiple options that you can include in a package for a client, with the multi choice field you can select all of the relevant options that the client wants. The member’s field displays a list of users from your Process Street account. You can also limit the list to only display users in a certain group. This is a useful field when you are organizing work. For example, in an employee review, you might want an employee to choose their manager from a group of managers. 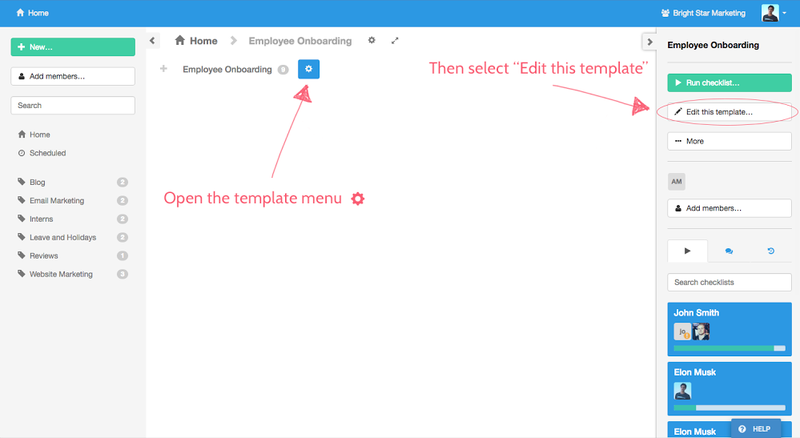 Or for New Client Onboarding, you could specify who the client’s Account Manager is. A hidden field can only be seen in the template edit view and can only be filled in by populating the field with data using our API or a Zapier integration. This field is best suited for recording vital information which will never change and is unique. For example, an email could change, so it’s best to store it in a single line field. However, a customer ID from your CRM will never change; this, along with any other kind of ID, is the main use for hidden fields. Sometimes it is critical that certain fields are completed when completing a task. To make a field required, simply check the ‘Required Field’ button underneath the field while editing a template. 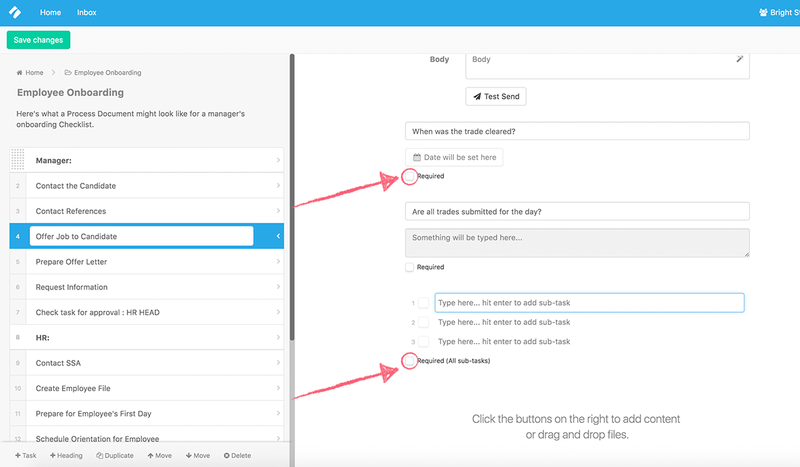 The information in form fields can also be pushed into other text or email widgets in your checklist, or even into other apps using integration links. For example, you could set up an email address form field to capture a client’s email address. Then, when the form field is filled out, that information can be pushed into a text or email widget without having to manually copy and paste. For more information, check out our articles on variables and integration links. Join us for a deeper look into what Process Street is and how to use it to effectively record, replicate, and replace your workflow!